‘I can only send you my best wishes.’ And money, of course. He’d wired a good amount to a Western Union, and told her she should go claim it at once. He hoped she would buy herself something pretty, he wrote, something she could show off when she came home. She supposed she should have been excited. She’d gone walking past the big department stores on Broadway, and she’d seen so many beautiful things in the window displays: afternoon dresses of crepe de chine, and hats trimmed in taffeta bows or smart feathers. There were many times at home when just the feel of new silk or a pretty shoe had brought her real comfort, and there was the satisfaction in usually being able, with the assistance of a good corset, to fasten a button on a narrow waist. But now the idea of shopping for clothes, even expensive New York clothes, only depressed her. She was irritated by the way he had written his suggestion. She wasn’t sure if it was the show off or the home that made her feel tired, even of taffeta and silk. She never knew when a gift was just a gift, truly given in caring, or just part of the charade. In any case, she had a better idea. observations: Cora’s whole life is going to change as a result of her trip to New York, and Alan is going to be very surprised indeed when she comes home. She is accompanying the lovely Louise Brooks – the real-life figure who will become a movie star – chaperoning her as she attends a dance summer school. Cora is certainly changed by being with Brooks but, unusually for a good narrative story, the reader doesn’t seem to get any impression that Brooks takes much from Cora, at this stage of the story anyway. Moriarty resists the easy path there, to the benefit of the book. The picture of Brooks is very convincing, as she behaves badly, shocks Cora, questions everything. You always get the feeling she wouldn’t at all have been a comfortable, or particularly nice, person to know. But always fascinating. Links up with: the book has featured before, here and here – the corsets mentioned above are a continuing feature. Louise Brooks has probably featured more on the blog than anyone else: click on the label below. Shopping for clothes is quite a trope – looking for bras, or a Chinese robe, or a new hat. 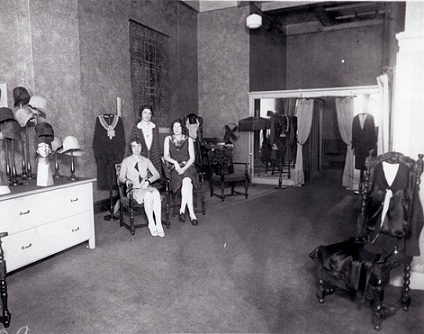 The picture, of a dress shop in 1925, is from Flickr.